Have you ever been on a game winning streak, or near an all time high score and your phone rings? Do you answer it, or keep going? Or perhaps your team really needed to get a hold of you to defend the team's title almost last minute but you were too immersed in your other game to notice the call. While the first two are common scenarios, there are also gamers who like to game at work whether it be at the office or at home. 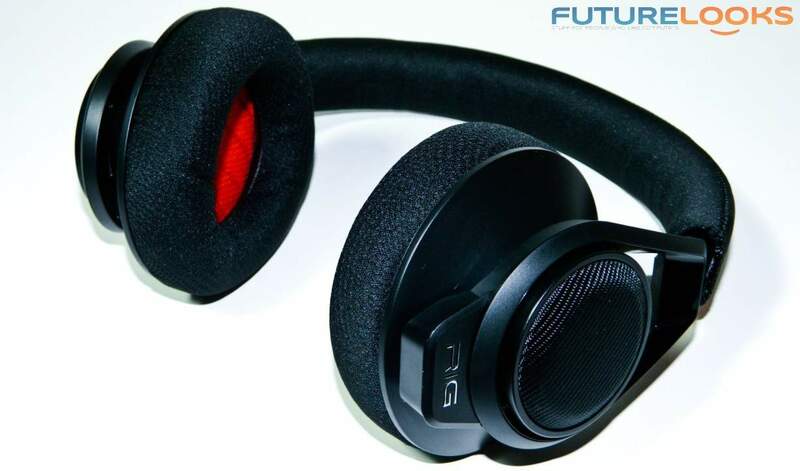 Imagine if you could hear and talk to your incoming calls without having to take off your gaming headset. Well, imagine no longer. 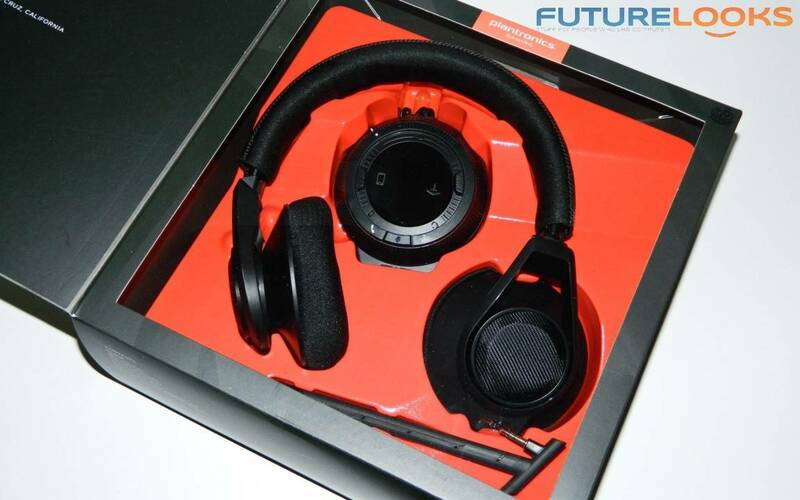 The Plantronics RIG Gaming Headset is exactly what you need. The RIG, by the newly reorganized Plantronics Gaming division, provides a unique level of connectivity and management so any console or PC gamer no longer has to interrupt their game winning streak or epic pwn destined to make the record books, to answer the phone. It even supports any music player as well, negating the need to use those cheap bundled ear buds that come with most smartphones. Especially the heinous white ones that come with "fruit products". A couple of key questions many of you no doubt have is how does the RIG headset work and is it difficult to use. 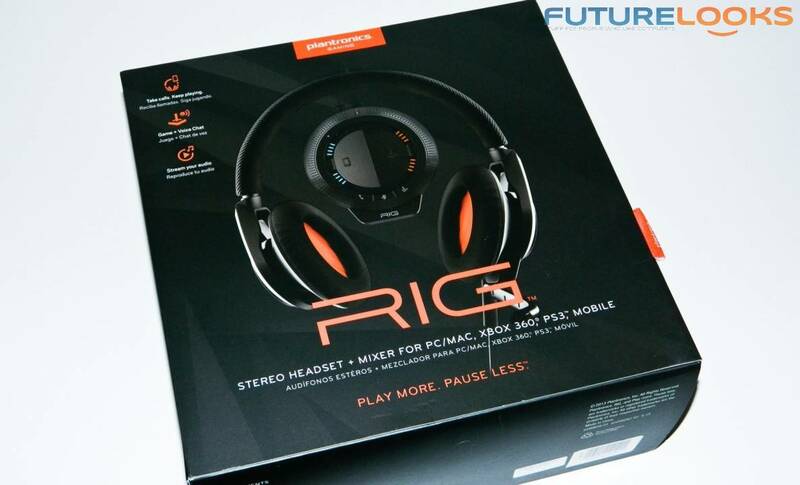 Thanks to the excellent marketing team, we got a special preview of the RIG Gaming Headset at PAX Prime 2013. Check out the video first before we get technical. The RIG connects to any PC/MAC, Xbox 360, PS3, smartphones, and tablets. We also heard that it should support the Xbox One and PS4 but that's still not official as both consoles are heading down different roads this time when it comes to headsets. Gamers can also connect the controllers associated with either console. With a decent sized 40mm driver in each ear cup, gamers should be able to hear everything clearly. Let's see what's in the box! 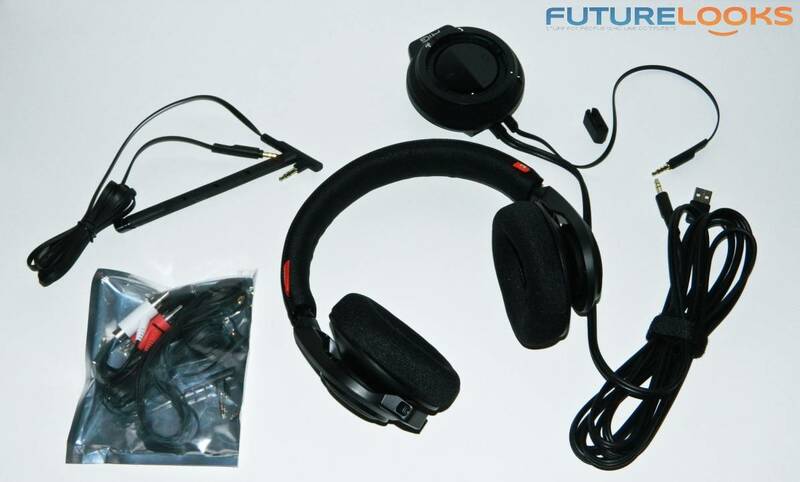 Naturally, the main package contains the "puck" mixer and headset. The rest of the accessories are behind the plastic. Plantronics made sure to include most any cable needed to connect the headset to a phone or PC, or pretty much any supported device. The cables include one 5 foot 1/8 audio cable with ear mic, one 3.5mm female to dual RCA cable, one 5 foot 3.5mm inline mic cable with volume control, and one 2.5mm analog 5 foot male cable. The main USB (roughly 10 ft) and 3.5mm (14 inch) cables are permanently attached to the puck. The main USB and main audio cable stretches the RIG out to about 15 feet from the console. Of course, you don't need that kind of distance with a desktop PC. One note worth mentioning is that until Plantronics chances the packaging, be careful removing your RIG headset. The red-orange plastic package is pretty rigid and kind of unforgiving as you try to pull the headset out. For those who didn't watch the video, there are two key components that make up the RIG: The "puck" and the headset itself. The "puck" is actually a mixer that controls the audio to any connected device and the headset. The large outside dial is the master volume. The two small sliders are volume control for phone (left) and headset (right). The bottom of the puck has three buttons. Naturally, the phone and mic buttons mute two of them. The third (right) equalizer with three presets set up to support different audio genres: Pure, Intensify, and Seismic. The black plastic center button allows you to toggle from your mobile device audio and computer audio. You can't hear the other when one is selected. That would have kind of been neat. The headset itself is one of the lightest worn to date most likely due to the lightweight plastics used in fabrication. The ear cup frames don't quite flex but they don't feel like padded steal cups on your ear either. The head band and cups are lined with rather durable cloth. However, the ear cups are made with a softer plush material for better fit. Some minor assembly is needed so let's get things put together before testing.